Ships from and sold by Empire Racing Parts. VISION MOTORWORKS Brand (NOT Generic) Guage Bezel Rings. 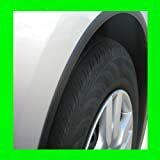 Fits the following vehicles: (ALL 1997-2004 Chevrolet Corvettes). Made of OEM grade matte silver ABS. Does not create a reflective glare. Dramatically enhances the look of your dash and gauges. Complete with 3M double side tape, NO GLUE REQUIRED. 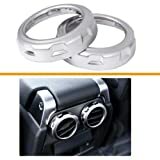 VISION MOTORWORKS Brand (NOT Generic) Guage Bezel Rings. Do you want to DRAMATICALLY improve the look of your Corvette’s interior dash? This set of 6 bezels will do just that! They will fit ALL 1997 – 2004 Corvettes. Please look at all of the pictures so that you can see the incredible difference it makes on the appearance of your car. The bezels are very easy to install once you remove the dash. Anyone can do this with regular hand tools if they are mechanically inclined. The dash removal is a little involved so if you are not mechanically inclined, we suggest professional installation. Once the dash is off all you need to do is simply peel and stick. They come with 3M double-sided tape. I recommend that you take the time to clean and dry your dash thoroughly simply because it will give longer results and your Corvette deserves the special attention. Vision Motorworks made these bezels out of OEM quality ABS plastic, as opposed to the aluminum others use, for several reasons. 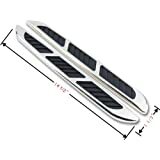 1 - Aluminum would have to be GLUED to the dash as it is not pliable and will NOT conform to the curves of the dash. 2 - Glue can and does make a mess. It can certainly ruin your dash. 3 - ABS is pliable and can easily conform to the dash for a perfect fit. 4 - ABS can also be mounted with 3M tape where the aluminum cannot. 5 – Another issue is glare. The current aluminum offerings create too much glare. The Vision Motorworks bezels are matte silver and do not create glare. 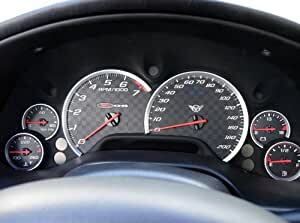 These Vision Motorworks bezels are without a doubt the nicest looking, best fitting, easiest to install gauge bezels for your Corvette available anywhere. Please look at the pictures and judge for yourself. 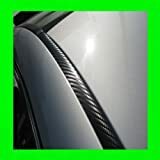 Fits the following vehicles: - ALL 1997-2004 Chevrolet Corvettes. Features: - Made of OEM grade matte silver ABS. - Does not create a reflective glare. - Dramatically enhances the look of your dash and gauges. - Complete with 3M double side tape, NO GLUE REQUIRED.